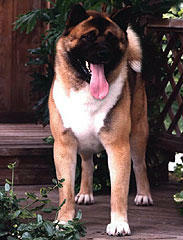 Am.Ch.Kuroi Kao Mariah I'm A Hero (Imp USA) - "Hero"
The Akitas history dates back nearly 40 years. The Akita is the largest of the spitz breeds and on of seven Japanese pure breeds that have been declared a national monument Primarily, the Akita is a working dog. It was used for hunting bear, wild boar and sled work: a companion and protector of children and home. The Akita has evolved into two distinctly different dogs. The Japanese Akita and the American Akita. The Japanese Akita is quite a bit smaller and slighter less substance, less bone. The American Akita as per our standard here in Australia calls for a dog to be "Large,Powerful Alert, with much Substance and Heavy bone. If it were necessary to describe the Akita in one word, "dignity" would suffice, for it is this concept that the breed embodies. Whether in proud stance or no-nonsense movement, the breed's dignified presence is its most distinct quality. Each element described in the standard is designed to contribute to this impression. 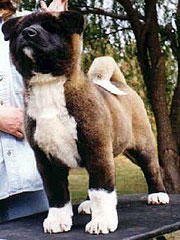 Aust.Ch.Akitahaven Ready'N WaitN - "Sabre"
The breed character is reserved, silent, and dominant over other canines. Although the Akita is unruffled by minor irritations, he is alert toward other dogs, and any serious challenge is met with swift retaliation. The Akita is a noble breed - dignified, intelligent, loyal, devoted, courageous, and aloof to strangers. Akitas can adapt to many different situations and can be marvellous watchdogs (typically not barking unless there's a good reason) and companions. They require a great deal of socialization as puppies, and obedience training is very important The Akita is a large, impressive and strong working dog. A prospective dog owner must take its heritage into consideration. This breed cannot be fed and forgotten - it must be given a chance to be a member of the family. It needs love, training, and exercise. More dog than a first-time dog owner may want to try, the Akita is for assertive, dog-oriented people. The Akita can suffer from a list of health problems, purchasing from a reputable kennel who's stock have been screened would be recommended.